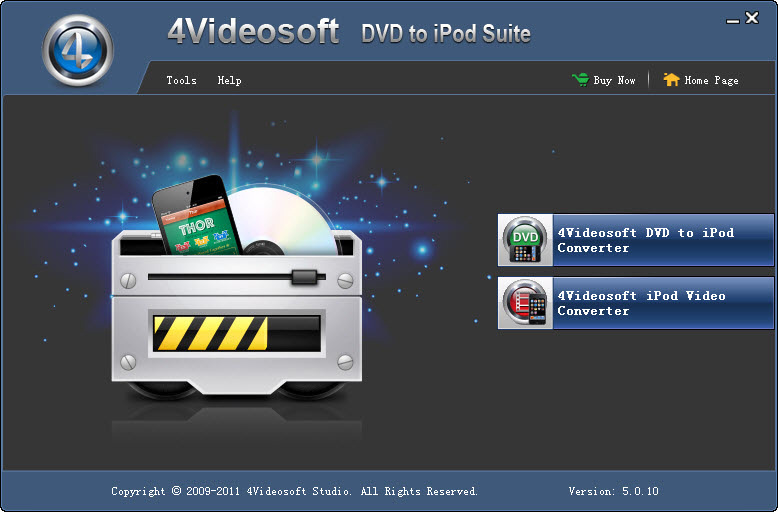 What are in 4Videosoft DVD to iPod Suite? 4Videosoft DVD to iPod Suite comprises two best iPod Converters: DVD to iPod Converter, iPod Video Converter. This iPod Converter is one discounted converter for you to put DVD to iPod, DVD to iPod touch, iPod nano, iPod classic, even converting DVD to your iPhone, Apple TV supporting MP4 video format. What’s more, 4Videosoft DVD to iPod Suite can convert video to iPod like convert MPG, MPEG, MPEG2, MTS, M2TS, TS, VOB, MP4, M4V, RM, RMVB, WMV, ASF, etc to MP4, H.264/MPEG-4 AVC(.mp4), MOV format for your iPod/iPhone. Optional editing functions are also available for you to optimize the output video, including trim, crop, merge, effect, take snapshot, etc. 4Videosoft DVD to iPod Suite reference? 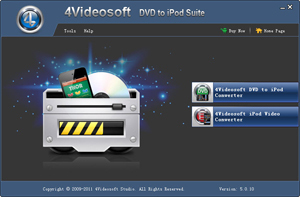 What 4Videosoft DVD to iPod Suite can do for you? 4Videosoft DVD to iPod Suite possesses the function of converting DVD to iPod MP4, along with converting DVD to iPod compatible audio formats. Convert video to iPod, including converting MPG, MPEG, MPEG2, MTS, M2TS, TS, VOB, MP4, M4V, RM, RMVB, WMV, ASF, etc to iPod using iPod Video Converter which helps you get iPod compatible audio formats as well. Adjust video effect- brightness, contrast, saturation, and volume. Get any time length segments from your DVD movie or video files, crop the DVD movie or video files playing region or adjust the output aspect ratio. Join your selected contents into one for your successive enjoyment. 4Videosoft DVD to iPod Suite is special designed for interlaced DVD movie and video. Convert interlaced one to the progressive to see it clearly. Capture your favorite pictures when previewing and save them in the default folder automatically, select DVD audio track and subtitle based on your needs. You can preview both your source and edited effect simultaneously.